ABC Television. 1994. Executive Producer: Ted Robinson. Musical Director: Phillip Scott. CD (ST)	ABC. 4797562. (CA 4797564). 1994. Musical Director and Arrangements: Phillip Scott. Producer Keith Walker for Dreamix Pty. Ltd. Cast: Jonathan Biggins, Drew ForsythePhillip Scott, Genevieve Lemon. Phillip Scott-Piano and Synthesisers, Craig Scott-Acoustic Bass, Neville L’Green-Electric Bass, Phil Scorgie-Bass on “To Be Or Not To Be”, Clive Lendich Guitars, Gordon Rytmeister-Drums, Jeremy Cook-Drums on “To Be Or Not To Be”, Ralph Pyl-Trumpet, Trevor Griffin-Saxophones. Orchestral Arrangements: Andrew Greene. The ABC’s West Australian Orchestra Conducted by Warick Stengards. Produced by Carl Edwards, Engineered by Bill Atkinson. Recorded at Studio 227, ABC Radio, Studio 620 Perth and Carr St Studio. Engineered by Keith Walker. Additional Engineers: Yossi Gabay, Dennis Fox, Neil Sandbach. Mastering Wayne Baptist Sony Music Mastering. 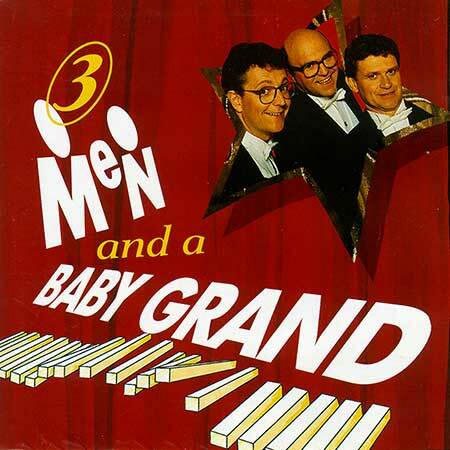 Three Men And A Baby Grand. (Scott/Biggins/Forsythe). v: Jonathan, Drew, Phillip, Genevieve. Waiati Poi. (Alfred Hill). v: Drew, Cast. Around Midnight. (Scott). v: Jonathan. Donald Where’s Your Trousers. (Trad. Scott/Biggins). v: Jonathan. Cabaret Europa. (Scott). v: Genevieve, Phillip. Nessun Dorma. (Puccini/Scott/Biggins/Forsythe). v: Jonathan, Drew, Phillip. ABC’s West Australian Symphony Orch. Rondo Alla Turca. (Mozart, Arr: Scott). v: Phillip, Craig, Gordon. Dag Rap. (Don Meers/Scott/Biggins/Forsythe). v: Jonathan, Drew, Phillip. This Is Me. (Scott). v: Peter Carroll. He’s One Can-Can. (Scott). v: Jonathan, Drew, Phillip, Genevieve. The Material Widow. v: Jonathan, Phillip, Genevieve. ABC’s West Australian Symphony Orchestra. b) Die Fledermaus. (Strauss, Arr: Scott). The Primitive Musical. Introduced by Christopher Hogwash. Out Of The Sea. (Scott). v: Jonathan, Drew, Phillip. She Beautiful. (Scott, Biggins). v: Jonathan, Genevieve. Missing Link. (Scott). v: Phillip. When Tomorrow Dawns. (Scott/Biggins). v: Jonathan, Drew, Phillip, Genevieve. Angels From The Realms Of Glory. (Trad. Arr: Scott). Christmas Round The World. (Scot/Biggins/Forsythe). v: Jonathan, Drew, Phillip, Genevieve. Eden Valley Blues. (Scott/Biggins). v: Jonathan, Cast. In The Hall Of The Mountain King. (Grieg, Arr: Scott). Remember The Days. (Scott/Biggins). v: Jonathan, Drew, Phillip, Genevieve. To Be Or Not To Be. (Scott/Biggins/Forsythe). v: Jonathan, Drew, Phillip, Genevieve. The History Of Chutney. (Scott/Biggins/Forsythe). v: Jonathan, Drew, Phillip, Genevieve. Ride Of The Valkyries. (R. Wagner, Arr: Scott). v: Phillip, Craig, Gordon. Dag Rap Re-mix. (Don Meers/Scott/Biggins).